We at Entropy Engineering are experts in video signals. More specifically we are specialists in decoding and using information embedded in Line 21 of an NTSC video signal. Line 21 contains the information that is used for Closed Caption. That is, text of what is being said on the video broadcast. We can provide hardware or PC-based software solutions. We currently have a product, News-To-You™, that goes between a video source and your PC. News-To-You captures the Closed Caption text and saves it on your PC. We are available for custom video work; software design, hardware design and consulting. 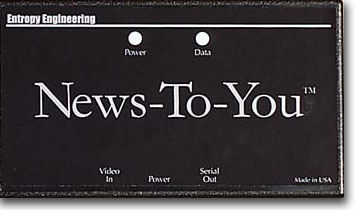 News-To-You™ is a hardware device that reads the Closed Caption information from a video signal and sends it to your computer. Most commercial broadcasts include this information, including news shows, soaps, movies, etc. News-To-You is an RS-232 based device that can easily be used with virtually any computer and operating system. Just plug a video source into News-To-You and connect it to your computer's serial port. Once in your computer, you can bring it into your word processor and print it, or search for key words. News-To-You is a hardware device, measuring approximately 5.5 x 3.25 x 1 inches. Contact us for pricing information. PR firms can monitor TV mentions of their clients. Please note the above copyright. All email addresses and other contact information are for the exclusive use of Entropy Engineering customers for matters concerning purchasing products and services from Entropy Engineering. We are not interested in buying anything from anybody. Therefore, any attempt to sell us anything using Internet contact information from this or any other source will be considered a violation of our copyright in this contact information.